Blue Lily Commission - "Eve Songs / Mooch - "In Search of the Acid Metal Grille" / Stephen Palmer - "Berlin via Cairo/Berlin via Istanbul"
This is the fourth issue in a row we've included reviews of new Stephen Palmer releases. And nobody could be happier than me. John Sherwood at Ambientlive gets my hero of the year award for recognizing and championing the talents of this gifted artist by making so much new and archival music available these past couple years. And the fun seems like it's never gonna stop because this issue we've got THREE new releases. 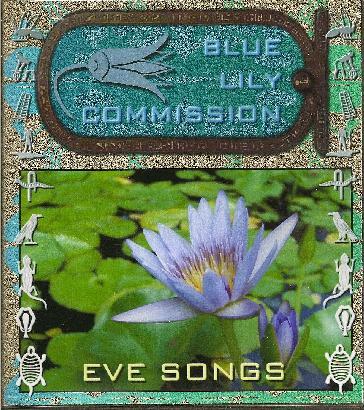 Eve Songs is the first Blue Lily Commission album since Eastern Evening from 2005, so I couldn't resist diving into it first. The CD consists of 4 tracks, all in the 14-19 minute range, so you know there's going to be some serious exploration. "Amman" opens the set and really took me by surprise, featuring Middle Eastern Kosmiche with a slice of saucy cabaret. The melody conjures up images of Marlene Dietrich doing a dancehall number, but the string instruments, along with the synth waves and electronics, are keeping things psychedelically in space. Different keyboards and ethnic string instruments take turns with their own style of delivering the main theme. The whole thing culminates in a heady concertina, WWII era Germany clashing with the Arabian bazaar, everybody's chewing Qat and all the instruments playing the melody are melting and mutating in my brain. This is a tough one to describe but I love it. Definitely different from anything I've heard from either Blue Lily Commission or Mooch. We're deep in Indian influenced space on "Bangalore Dub". A meandering droning sitar is punctuated by flashing and often freaked out alien electronic waves, angelic choral voices, gorgeous meditative melodies, cosmic call-to-prayer horns, and, of course, a deep Dub groove. Multiple keyboard and synth parts, some injecting a bit of an Ozric Tentacles feel, keep the melodic theme and atmosphere constantly on the move, adding variety and complexity, but the whole thing flooooooows so nicely. "Crescent" is next and starts off with assertive spiritual horns, backed by an electronic, partly droning, bass like wave that I could feel flowing through my body. Then the music does an about-face and launches into a theme similar to the cabaret style I described on "Amman", though it's also got salsa type rhythms, as if to replace Marlene Dietrich with Carmen Miranda. But the Middle Eastern influences are stronger on this piece so if Miranda and her fruit salad headdress are present then she's been kidnapped and performing in a haram now. I really dig the groove this music has, and with all the spacey atmospherics and some Tangerine Dream like keyboards added in this is quite the stylistic melting pot. Finally, we've got "Dharamsala Dub", with its flowing droning sitar, cosmic electronics, spaced out flute/horn, and the expected Dub groove. Middle Eastern chanting and killer swirling effects propel it all into space, for an ethnic tinged space rock voyage that just swept me away. There are multiple contributing elements, and again I hear bits of the Ozrics, but overall this is like an ethnic/psychedelic/space rock/cosmic Dub journey across India and Arabia. Wow, Eve Songs really bowled me over. It's tough to describe and is probably some of the most challenging music I've heard from Stephen Palmer yet. There's so much happening, so many pieces put together in interesting ways, there's no way you'll soak it all in without multiple listens. HIGHEST recommendation. Continuing with the Ambientlive reissue series of past Mooch albums and unreleased archival material is In Search of the Acid Metal Grille, a two CD set with the original album plus a second CD of never before released music from the same period. Originally released in 1998 on Andy G's Dead Earnest label, In Search of the Acid Metal Grille was my introduction to Steve Palmer's work, and I was looking forward to reading my own impressions a decade later, after having since digested many other Palmer albums. Both CDs include Peter Wyer on guitar, Garry Lewin on synths, and Phil Watson on synths, though Palmer-Wyer and Palmer-Lewin-Watson are paired on separate tracks. The original album starts off with a 23 minute Palmer-Wyer track called "Ocean of Mercury". The music begins as a Tangerine Dream-Pink Floyd blend, with various synth parts and sporadic but significant guitar bits from Wyer. After several minutes the keyboards recede and the duo go into light exploration mode, with scattered sound effects, soundscapes, and various other patterns and textures. Very playful but also very intense, and gets increasingly so as the piece develops, eventually returning to the Floydian theme, though this time with a deep space symphonic edge and all sorts of bubbling and rumbling synths bits. And as we approach the final portion of the track the volume increases, with the keyboards even more Floyd like and Wyer really rocks out on guitar. Lots of changes and transitions throughout this lengthy gem. "In Search of the Homo Sapiens Psychedelicus" is a Palmer-Lewin-Watson electronic track. Right away we've got a cool, peaceful percussive groove going, sounding like tablas, plus spacey exploratory synth lines and effects. Again I hear bits of Pink Floyd in the keyboards, but with a tribal feel and more intently spaced out, with a parade of fun alien electronics adding color and character to the music. The main theme is like the spaceship ride and all the accompanying electronics are like the space debris shooting past as you look out the window. "Acid Drenched Symphony" is another Palmer-Wyer track. Right away we're hit with a tension laden spacey theme, along with rapidly bubbling electronic patterns and steady electro cymbal rhythms. The percussion remains steady as the electronics start to swirl, winding guitar licks are introduced, and we find ourselves in Tangerine Dreamy space, though there's so much more varied sound experimentation here. Nearly halfway through, Wyer's guitar steps out front and rocks out in a jamming but easy paced hard rock style, his ripping licks sounding great accompanied by the symphonic keys and darting electronics. The pace really starts to pick up until we've got a rapid fire electro dance groove going, though all the while the guitar and atmospherics remain calm, tripping along at their own stride. Finally we have another Palmer-Lewin-Watson track, "Vastscape", which at just over 7 minutes is the shortest track on the album. Once again the trio cut loose and focus just as much on sound creation as deep space atmosphere and drift. 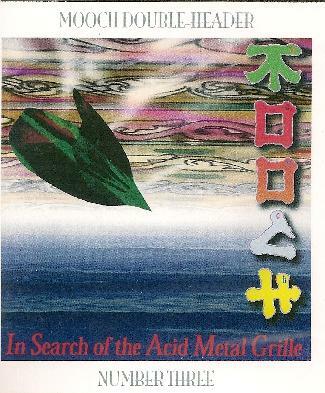 The second CD, with all unreleased material, is titled The Acid Metal Grille Sessions and includes 5 tracks, with the same participating musicians as the original album. "Liquidy Jungly Canopy" is the only track with Pete Wyer. It consists of a syncopated electro pulse, spacescapes, whining liquid guitar licks, jangling cans, rushing water and masses of crickets chirping. I like the combination of off-kilter dance grooves, space symphonics and sounds of nature, giving the thing a surreal campsite cookout in space feel. Later the grooves get deeper and the guitar even more hypnotic. Some of the most spellbinding guitar work on either CD. Homo Sapiens Psychedelicus Found" is the only track to feature the trio of Palmer-Lewin-Watson. A repetitive space orchestral theme serves as the foundation for a competing banquet of spaced out sounds and effects, soon developing into a majestic space-prog symphony. "International Weightlessness" is a Palmer-Lewin duo track, and once again we have grand symphonics, this time accompanied by a frisky synth pattern. The symphonic keys come and go, leaving the angular synths to meet head on with some howling soundscape waves. Mind-expanding, disorienting, and always engaging, this is a great track for those who like to listen closely to all the details. And a great powerhouse finale too. There are also two short Palmer ambient tracks, "Identity" and "Universal". The liner notes say these tracks are intentionally beatless and rhythmless, and while they are based in ambient music, there's far more happening then pure ambience. More layers, more electronics, and in the case of "Universal", somewhat symphonic. This is music you can close your eyes and float away with, or give your undivided attention to and marvel at all the elements and layers that go into creating it. 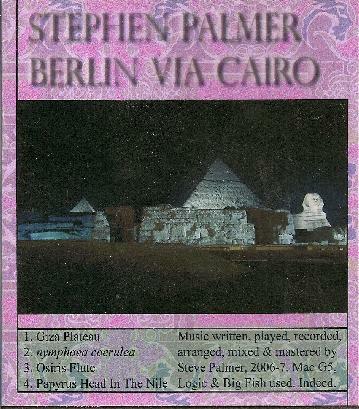 Finally, we have the two CD set - Berlin via Cairo & Berlin via Instanbul, credited to Stephen Palmer rather than a specific band/project name. This is Steve's homage to his earliest influences, German electronic pioneers like Tangerine Dream, Klaus Schulze, Michael Hoenig and Robert Schroeder. But there are also ethnic influences creeping in, not unlike Blue Lily Commission, and I liked the reference on the Ambientlive site describing this as what might have happened had Tangerine Dream et al recorded with Peter Gabriel in the Real World studios. "Giza Plateau" opens the Cairo set with piano, crashing ocean waves and space synths, but Steve quickly settles into an electronic groove that's pure 70s Klaus Schulze and Tangerine Dream. And when the guitar kicks in and starts to jam we're really rocking in space. Later we hear some ethnic horns which inject a Blue Lily Commission feel into the music, though the classic 70s sequenced synths continue to rumble alongside. "nymphaea caerulea" starts off light and spacey with Dub bass and more Blue Lily styled ethnic horns. We're also treated to excellent guitar on this one. Spacey liquid psychedelic jamming licks, along with keyboard melodies that remind me of a Goblin soundtrack, ethnic percussion and that cool Dub pulse. Then around the 13 minute mark space-industrial synths indicate a transition to a more subdued, darkly atmospheric, sound exploratory segment. Like an extended introductory buildup, it has a space-ambient but rich cinematic feel, like the soundtrack to an avant-garde documentary about space exploration. Eventually we return to the opening theme and we're back in dreamy rocking space for the duration. Nearly 30 minutes of luscious spaced out BLISS! And speaking of bliss� we've got a flute and mellotron combination on "Osiris Flute", a brief track that sets the stage for "Papyrus Head In The Nile", which right out of the gate made me feel like I was among the pyramids. It develops into Blue Lily styled space trip, with cosmic horn and sequenced synths. And of course we travel through a variety of themes, from spunky, almost jazzy, keyboard driven rocker, to more deep space drift. The aptly titled "Garden of Earthly Passions" kicks off the Istanbul CD with ethnic horns, wind-swept synths, bells and mellotron. All this sets the stage for the main portion, a spirited synth melody and rhythms. The guitar jams while the mellotron sings, and the sequenced rhythms lay down a steady groove, and ethnic stringed instruments add the Turkish delight. Very much at the crossroads of 70s Berlin school, the ethnic psychedelia of Blue Lily Commission, and deep space progressive rock. Next up is the once again appropriately titled "Smoking Oriental Censer". A steady dancey sequenced pattern opens the track, with lots of additional gurgling space electronics, and then a zither starts to jam along with it, and throughout the track trading off with cool guitar jamming. In fact, this has some of the most ripping guitar I've heard from Steve. Excellent spaced out dance grooves and even some cosmic jazzy vibes as well. We've definitely taken Berlin to Istanbul on this one. A heavenly 20 minute journey. Finally, we've got "Turkish Delight".... ooooh, flute and mellotron again, plus a bouncy sequenced synth pattern. Another outstanding space-prog excursion, though somewhat more minimal in parts than the rest of the set. A minimalist brand of Berlin school, but still with the ethnic influences, varied rhythms, lots of freaky electronics, and more rocking guitar too. In summary, Steve does a great job of wearing his influences on his shirtsleeves while in no way being completely retro. The Berlin meets the East theme is apparent throughout, but the Blue Lily Commission elements and spacey progressive rock are prominent as well. So� does that sound like a tasty variety of music across these three sets? My brain is happy.